Many students don't really feel confortable with the class material seen during their lectures and seek to better understand what has been taught to them in a more interesting and motivating way. An interactive tool, additionally to their lectures, would therefore be a very good way to improve their learning. Indeed, most of students have a smart phone and would consequently be pleased to use it for a better visualization of the class material. 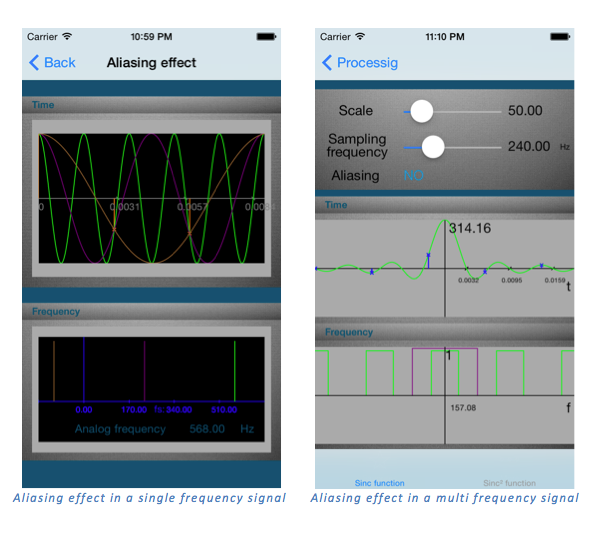 The goal of this project is the development of an interactive application for iPhone concerning Signals and Systems Course and will be done in Objective- C. It illustrates more specifically the concept of sampling and the aliasing effect in signal processing field. The user might adjust the signal's wavelength 1/f, the frequency f and the sampling frequency fs in all the views only by touching the screen (Pinch or Pan gesture).